OK, I'm about to reinstall the Java and Adobe, will post again after that step. Thanks! Internet Explorer is not working, but Chrome is. When I open IE I see a blank page. It will not refresh. When I manually type a page address it says "Navigation to the webpage was cancelled." try to repair or re-install IE! Thank you, I did successfully re-install IE. 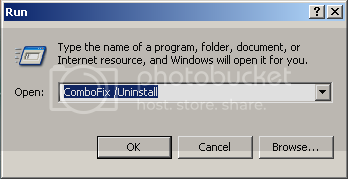 I also, unfortunately, had to uninstall Java 7 and re-install version 6 in order to use a program that we use at work. According to the most recent logs, does the computer look clean? Press the Windows key + R and this will open the Run text box. Copy/paste the following text into the Run box as shown and click OK.
Right-click AdwCleaner.exe and select Run As Administrator. You did a GREAT job. Very thorough. I will start these attempts today and tomorrow and post if I have any problems. Do you recommend keeping MalWareBytes? What anti-virus do you recommend. Which Internet browser do you prefer, IE, Chrome, or Firefox? You are very welcome, jhess23a. Do you recommend keeping MalWareBytes? Which Internet browser do you prefer, IE, Chrome, or Firefox? You can keep Malwarebytes Anti-Malware.